Catherine Constance: Friday at last. . .
heehee, love that you asked then did it anyway! revenge indeed :) Clearly they don't know how lucky they are! Silly children - what do they know! Good for you for persevering. They'll thank you for it! Cute sketch, love the owl! And that is a shocker, those cheeky 5 yr olds! Children refusing to hear a story? No way! I love your response and tho s cute illo. Such beautiful heart-warming art..I love it..i am in love with the doggie too!! Sweet! Loved your story! Love the sketch...and for sure a shocker...what? no to a story? Maybe the kids were just cranky that day. Good for you carrying on regardless!! Love your sketch ~ so adorable and fun! Don't let the 'little turkeys' get to ya ~thanks, namaste, Carol ^_^ Happy SS and Happy Thanksgiving to you! I love the blush on their cheeks. So adorable! your sketch is so cute! 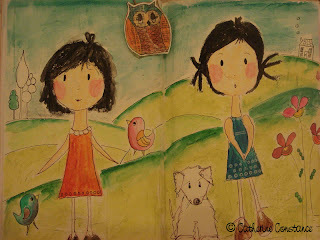 I love the owl and the birds and the girls and...well, everything! ah, this is a sad thing the kids not wanting a story. i wonder if it has to do with lots of tv and electronic games that move at a different pace. a world without story telling would be a life out of balance. sometimes adults have to make decisions.... i like yours: read to them anyway. your art is so cute. Children can be so entertaining sometimes but I bet you reading the story anyways was the sweet revenge :). Your drawings reminds me of children's stories illustrations. This is a sweet illustration. Love the little doggie and the expressions on the two girls. this is so so sweet!!!! wonderful work!!!! I have a cupcake tutorial to share with you...so pop by!!! !